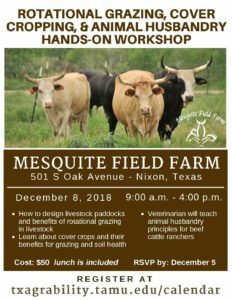 Participants will learn how to perform paddock design and usage of electric fencing to maintain daily rotation of grass fed beef cattle. Also the introduction of cover crops into their paddocks for supplemental grazing and nutrient restoration to the soil. With the end result of improved animal quality and soil nutrient supply due to these improved systems. Additionally our veterinarian will provide animal husbandry information for beef ranchers.